SEPTEMBER 20 - 26, 2017 UCW 3 WWW.UPANDCOMINGWEEKLY.COM V.I.P Early Bird Edition delivered "Free" directly to your computer every week. Sign on today! 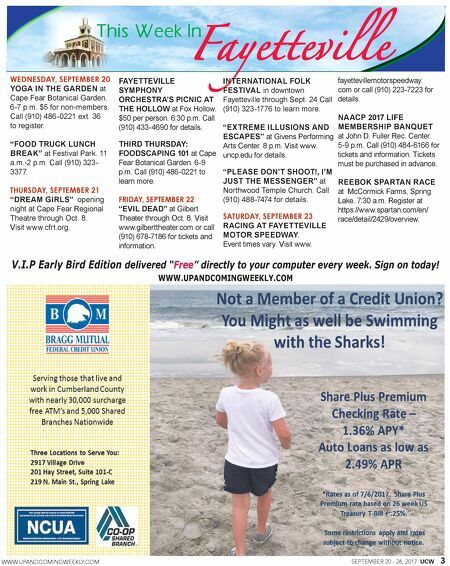 WWW.UPANDCOMINGWEEKLY.COM This Week In Fayetteville WEDNESDAY, SEPTEMBER 20 YOGA IN THE GARDEN at Cape Fear Botanical Garden. 6-7 p.m. $5 for non-members. Call (910) 486-0221 ext. 36 to register. "FOOD TRUCK LUNCH BREAK" at Festival Park. 11 a.m.-2 p.m. Call (910) 323- 3377. THURSDAY, SEPTEMBER 21 "DREAM GIRLS" opening night at Cape Fear Regional Theatre through Oct. 8. Visit www.cfrt.org. FAYETTEVILLE SYMPHONY ORCHESTRA'S PICNIC AT THE HOLLOW at Fox Hollow. $50 per person. 6:30 p.m. Call (910) 433-4690 for details. THIRD THURSDAY: FOODSCAPING 101 at Cape Fear Botanical Garden. 6-9 p.m. Call (910) 486-0221 to learn more. FRIDAY, SEPTEMBER 22 "EVIL DEAD" at Gilbert Theater through Oct. 8. Visit www.gilberttheater.com or call (910) 678-7186 for tickets and information. fayettevillemotorspeedway. com or call (910) 223-7223 for details. NAACP 2017 LIFE MEMBERSHIP BANQUET at John D. Fuller Rec. Center. 5-9 p.m. Call (910) 484-6166 for tickets and information. Tickets must be purchased in advance. REEBOK SPARTAN RACE at McCormick Farms, Spring Lake. 7:30 a.m. Register at https://www.spartan.com/en/ race/detail/2429/overview. INTERNATIONAL FOLK FESTIVAL in downtown Fayetteville through Sept. 24 Call (910) 323-1776 to learn more. "EXTREME ILLUSIONS AND ESCAPES" at Givens Performing Arts Center. 8 p.m. Visit www. uncp.edu for details. "PLEASE DON'T SHOOT!, I'M JUST THE MESSENGER" at Northwood Temple Church. Call (910) 488-7474 for details. SATURDAY, SEPTEMBER 23 RACING AT FAYETTEVILLE MOTOR SPEEDWAY. Event times vary. Visit www.